Home Blog What is Heath Care Like in Italy? Before you begin working your way to foreign language fluency, it helps to understand the culture behind the language you’re learning. After all, language exists to help a group of people express their ideas and beliefs. Italy is an old country with a rich history and culture. As you begin your Italian language program, gaining a strong grasp on this history, the values, and the etiquette will help you rapidly achieve success. In particular, Italians value their health care system, but they also take pride in living an active lifestyle to stay healthy and fit as they are the healthiest nation in the world. While many travelers remember to bring along a stock of basic medications like aspirin or ibuprofen, you always run the risk of needing more. Adapting to a new culture can often bring a host of annoying symptoms like stomach aches or difficulty sleeping, and for these common ailments, the “farmacia” will have you covered. If possible, it is always best to bring along a packet of the medication you do have; while the “farmacia” staff may not carry the same brand, they will be able to read the ingredients and recommend something of a similar composition. If you are feeling healthy but still in need of some mental recuperating, seek out one of Italy’s noteworthy spas. The country is home to over 100 relaxing and soothing spas with affordable price ranges, and many can be found in some of Italy’s most visited areas, such as Milan and the southern island of Ischia. If Tuscany is on the agenda, look for Montecatini, one of the most famous spas in Italy. In 2017, Bloomberg declared Italy to be the healthiest nation in the world, based on life expectancy, health risks, and a few other factors that contribute to a person’s overall wellbeing. Italians have impressively long lifespans, with men living on average 76 years and women 82, according to the United Nations. Many believe the Italian diet with its heavy Mediterranean influences to be a major contributing factor to the vitality of the population. Healthy fats, such as olive oil and nuts, paired with lean proteins, like seafood and poultry, are believed to play a role in the overall health of the Italian people. Italians also have better access to healthcare than many nations. There are more doctors per capita than any other country (1 in 160 residents), and medical staff are known for being extremely well-trained. This type of premium medical care keeps Italians healthy, which results in a lower overall economic “footprint” for healthcare costs. In fact, the industry makes up only about six percent of the nation’s GDP. Compare this with the United Kingdom’s figure of just under ten percent in 2014 and you will see why it is so significant to improving the health of the population. Many Italian doctors speak English, which should be great news to any tourists traveling throughout Italy. There is a medical system in place, known as “Guardia Medica Turistica,” which offers emergency medical services to tourists. When navigating a foreign country, nothing throws a spanner in the works quite like an unexpected illness or unfortunate injury, but visitors of Italy can rest assured that they will be taken care of by some of the world’s best physicians. 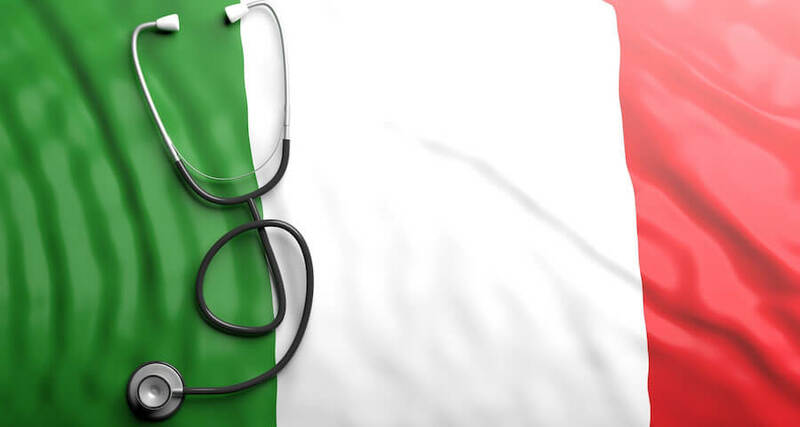 Italy’s national healthcare system, the “Servizio Sanitario Nazionale” (SSN), was established in 1978 to serve residents who may choose not to invest in private health insurance. This system provides all permanent residents and expatriates with adequate health coverage, regardless of socioeconomic status. Although waiting times can be longer and vary by region, the coverage it provides is definitely beneficial to the Italians who need it. Expatriates living in Italy can benefit from investing in private health insurance, which can reduce waiting times and copays. By choosing this service, you are investing in your health and your peace of mind. Visitors suffering from illnesses or injuries that are not life-threatening should seek out a local family doctor (“medico generico”). Health clinics (“azienda sanita locale” or ASL), such as the Milan Clinic in Milan, are also available to non-residents. Hospitals are relatively easy to find; simply search for signs or symbols with a white capital H on a blue background. In Rome, the Rome American Hospital and the Salvator Mundi International Hospital are great options that staff English-speaking doctors. Remember to bring your insurance cards and you will be taken care of accordingly. For medical concerns such as dental, vision, or prescription medication refills, the options once arriving in Italy are not as abundant. Though not impossible, it is definitely not advisable for a tourist to try and take care of these things during their time in Italy. While emergencies can happen, preparation can help prevent them. It is very unlikely that dentists are fluent in English. The language barrier can create even more stress and confusion, adding to your already difficult situation. It’s very important to have any dental health concerns checked out before heading to Italy. For those who have optical health issues, preparation is very important. Take the time to ensure that you have an extra pair of glasses or plenty of replacement contact lenses to bring along in case your glasses are scratched or your contact lenses tear. Some areas of Italy can be quite dry, so contact wearers should take extra care to keep eye drops or saline solution on hand. Dehydrated contact lenses can cause irritation, and finding replacements once in Italy could prove to be a daunting task. Prescription drugs may also be challenging to get refilled, so make sure to bring more than enough to keep you covered during your time abroad. For over-the-counter medications, seek out a general store or pharmacy (“farmacia”). These stores should have enough to keep your basic needs taken care of.